Basler Flight Services uses a fuel request tag system in order to manage the high volume of aircraft at the EAA AirVenture show. You need to obtain a fuel tag from a Basler booth, office, Basler employee, or from any EAA registration booth. These tags may be green or yellow. The exception being Warbirds which are always white. Be sure to fill out the tag completely and then hang it on your prop. 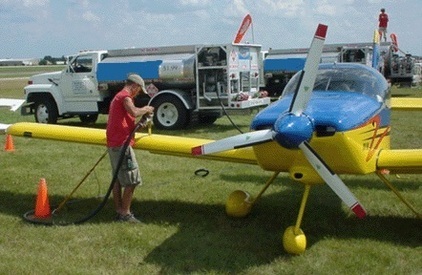 A fuel truck will come by and service the aircraft according to your instructions. Our drivers are not equipped to handle payments. Stop by one of our fuel booths or the office prior to departure to pay your bill. Aircraft parked on our hard surface ramps do not need a fuel tag and can order fuel when checking in at our FBO office. Our fuel trucks will not have oil on them. Oil can be obtained at our booths or FBO office. We will have four wheelers canvasing the south 40 handing out tags and directing our fuel trucks. Please do not wait until the day of your departure to request fuel. We may not be able to get to you as soon as you would like. Warbirds need to obtain a WHITE tag from our north booth, Warbird registration, or our FBO office. With the addition of our South-South booth last year, next to the EAA south market booth, we now have (3) fuel booths on the field where you can obtain tickets and pay for fueling. These booths will open at 8AM each morning. We encourage you not to call the office for your fuel bill. All unpaid tags are in the booths on the field during the day. If you do call or e-mail the office to pay for fuel we will take your information and call or email you back as soon as possible.